Without a doubt I can say that Benedict Cumberbatch is my favorite Sherlock of ALL TIMES. That includes every single actor I have seen playing Sherlock on TV and movies EVER [yes, even Robert Downey Jr.]. I may not be as obsessed with Martin Freeman as I am with Benedict Cumberbatch but I also like him a lot. I wouldn’t say he is my favorite Watson [I think that honor goes to Jude Law], but he is close. So, as you can see, I LOVE the British duo. However, I like the American duo almost as much. Let’s begin with the fact that Jonny Lee Miller is actually British [yes, I prefer my Sherlocks British], and he is a great actor [and pretty easy on the eyes too]. He’s been around for a while, so I was actually more familiar with Jonny’s work than Benedict’s. I REALLY like Jonny Lee Miller’s performance, making him my second favorite Sherlock ever. Now for American Watson… I am actually not against the idea of making Watson a woman; it is an interesting concept and I thought casting Lucy Liu was brilliant. Jonny and Lucy have great chemistry and are among my favorite “platonic” couples at the moment. POINT FOR: UK… but barely! I like the American duo almost as much, I only give this to the Brits because I like Benedict Cumberbatch THAT much. Here is where I think the British have the upper hand. Their modern day version of Sherlock is one of the best adaptations ever. Steven Moffat knew what he was doing, having modernized Jekyll & Hyde before on his brilliant series Jekyll. Sherlock’s episodes play more like movies than TV shows. They only produce 3 episodes per year and each one follows the plot of one of the books, but in a modern setting. They justify the change in time period by creatively incorporating technology into the mysteries. Sherlock is quick-paced, intriguing and full of unexpected twists. You can’t help to be constantly in awe of Sherlock’s brilliance. In contrast, the American adaptation is only loosely based on the books. Basically, it only borrows the characters’ names and some traits: like the history of drug abuse and tormented relationship with Irene Adler. 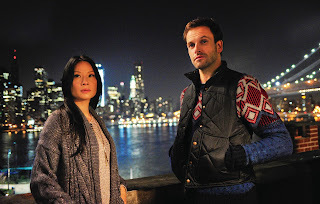 Beyond that, Elementary is similar to pretty much any other CBS procedural cop drama. Yes, they do have two very compelling leads played by great actors who carry the show; however, the cases they solve are just average. They are not badly written or anything, but on many episodes I was able to quickly deduce the killer, motive and execution of the crime… and I am no Sherlock, let me tell you that. Sometimes I am even able to figure stuff out quicker than Sherlock and that wouldn’t be so bad if he was some other detective… but he is supposed to be the best sleuth of all times! As I said many times before, Elementary is a very good procedural drama that I enjoy watching, however it is not a mind-blowing show about the greatest detective of all times. Finally if we are talking about “originality”, Sherlock came out first and it was like nothing we had seen before. Soon after the Americans adopted the idea of a “modern day Sherlock”, which was a cool idea of course, but not new anymore. POINT FOR: UK, for sure. Finally, the city. British Sherlock may have changed time period, but it kept the original location: London; including the original address of Sherlock’s flat: “221B Baker Street”. The city of London is almost another character in the show; it gives Sherlock a timeless atmosphere and serves as a way of connecting the modern day plot with the classic tales from the books. Elementary is set in New York City which is one of my favorite cities in the entire world. New York is truly an incredible city with many iconic locations made famous by TV shows and movies. However, I don’t think NY does much for Elementary. Perhaps it is the fact that we see SO MANY cop shows set in NY [White Collar, CSI:NY, Blue Bloods just at the top of my head]. I don’t think they even had many episodes where the location was a major plot point. It could very well be set in LA and it would be the same show. So, as much as I love NY, I would rather see Sherlock walking the streets of London. The Verdict: As you can see, I’ve pretty much chosen Sherlock over Elementary on every aspect; which is no surprise since I had already stated that I am a huge Sherlock fan. However, instead of concluding the British did it better than the Americans, I feel I should conclude that these shows can’t really be compared. They are two different shows. One is a faithful modern day adaptation of the classic books; the other is an enjoyable procedural with a quirky detective and a lovable sidekick. The dynamic between the leads, the tone and style are completely different [perhaps CBS was trying to avoid a lawsuit]. Is Sherlock the better show in my opinion? YES, but it doesn’t mean Elementary should be dismissed. It is a show worth watching, especially if you are looking for a “case of the week” type show. Sherlock and Elementary are simply paying on different leagues. I'm less convinced about both Sherlock and Doctor Who here in the UK. Too many filming gimmicks, slow motion, etc. As tiresome as reading a magazine with flashy highlights and graphics, which tend to distract from the narrative. It's funny how anyone who opens a blog can be self righteous and even think that they made objective statements. Well, it's not the case. And everything I read in this blog is completely subjective. 1. Sherlock UK looks like Merlin (the guy in the tv show) but older. 2. Sherlock UK manages to look old and boring. (for you it's authentic). 3. Really? You manage to find the criminal before Sherlock does in elementary? I could deduce something about you based on this comment but I doubt it would get through the language filter. hahaha "Anonymous" this is one of the times I wish I could "LIKE" a comment on blogger hehe. And "Nitefox" I am just wondering... have you even watched Sherlock? Because all your comments are about how BC looks... which is REALLY not the point. I personally believe JLM is much better looking, but again... not the point... this is about the show, the writing and the portrayal of the characters. Also... aren't blogs exactly that? A way for people to express their opinions on a given subject??? 1. How is that relevant? Is there something wrong with one incredible actor looking like another? 2. Because that was SUCH an objective comment. As a matter of fact, there are many people who could vouch for the impressive cinematography, and how refreshing this interpretation is overall. If you bothered to watch it, you would at least find it compelling. Far from "old and boring". 3. Expressing disbelief in such a manner is rude. Who are you to say that her claim is false? Do you personally know her and watch the show with her to see if that's what she does/doesn't do? Do you believe that you have the right to determine a stranger's intelligence/perceptual skills? This apparently links back to your general problem in terms of judging things by appearance and superficiality. Bottom line: Don't look at the show - watch it. P.S. I think you meant "deduce" there, but if you really did mean "deduct", you ought to deduct your presence. 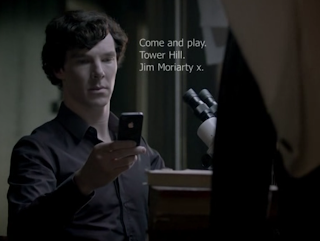 I love Sherlock but surely there's room for both these great shows?